The Cyropaedia (or Cyropedia) is a biography of Cyrus the Great, written in the early 4th century BC. 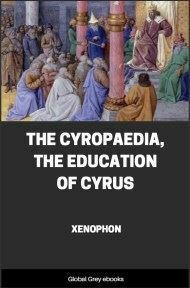 In substance, The Cyropaedia is "a political romance, describing the education of the ideal ruler, trained to rule as a benevolent despot over his admiring and willing subjects." (C.1) We have had occasion before now to reflect how often democracies have been overthrown by the desire for some other type of government, how often monarchies and oligarchies have been swept away by movements of the people, how often would-be despots have fallen in their turn, some at the outset by one stroke, while whose who have maintained their rule for ever so brief a season are looked upon with wonder as marvels of sagacity and success. The same lesson, we had little doubt, was to be learnt from the family: the household might be great or small—even the master of few could hardly count on the obedience of his little flock. (2) And so, one idea leading to another, we came to shape our reflexions thus: Drovers may certainly be called the rulers of their cattle and horse-breeders the rulers of their studs—all herdsmen, in short, may reasonably be considered the governors of the animals they guard. If, then, we were to believe the evidence of our senses, was it not obvious that flocks and herds were more ready to obey their keepers than men their rulers? Watch the cattle wending their way wherever their herdsmen guide them, see them grazing in the pastures where they are sent and abstaining from forbidden grounds, the fruit of their own bodies they yield to their master to use as he thinks best; nor have we ever seen one flock among them all combining against their guardian, either to disobey him or to refuse him the absolute control of their produce. On the contrary, they are more apt to show hostility against other animals than against the owner who derives advantage from them. But with man the rule is converse; men unite against none so readily as against those whom they see attempting to rule over them. (3) As long, therefore, as we followed these reflexions, we could not but conclude that man is by nature fitted to govern all creatures, except his fellow-man. But when we came to realise the character of Cyrus the Persian, we were led to a change of mind: here is a man, we said, who won for himself obedience from thousands of his fellows, from cities and tribes innumerable: we must ask ourselves whether the government of men is after all an impossible or even a difficult task, provided one set about it in the right way. Cyrus, we know, found the readiest obedience in his subjects, though some of them dwelt at a distance which it would take days and months to traverse, and among them were men who had never set eyes on him, and for the matter of that could never hope to do so, and yet they were willing to obey him. (4) Cyrus did indeed eclipse all other monarchs, before or since, and I include not only those who have inherited their power, but those who have won empire by their own exertions. 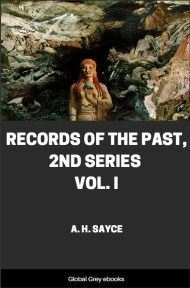 How far he surpassed them all may be felt if we remember that no Scythian, although the Scythians are reckoned by their myriads, has ever succeeded in dominating a foreign nation; indeed the Scythian would be well content could he but keep his government unbroken over his own tribe and people. The same is true of the Thracians and the Illyrians, and indeed of all other nations within our ken; in Europe, at any rate, their condition is even now one of independence, and of such separation as would seem to be permanent. Now this was the state in which Cyrus found the tribes and peoples of Asia when, at the head of a small Persian force, he started on his career. 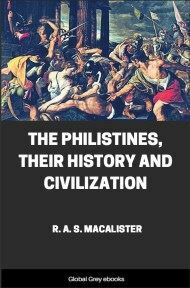 The Medes and the Hyrcanians accepted his leadership willingly, but it was through conquest that he won Syria, Assyria, Arabia, Cappadocia, the two Phrygias, Lydia, Caria, Phoenicia, and Babylonia. Then he established his rule over the Bactrians, Indians, and Cilicians, over the Sakians, Paphlagonians, and Magadidians, over a host of other tribes the very names of which defy the memory of the chronicler; and last of all he brought the Hellenes in Asia beneath his sway, and by a descent on the seaboard Cyprus and Egypt also. (5) It is obvious that among this congeries of nations few, if any, could have spoken the same language as himself, or understood one another, but none the less Cyrus was able so to penetrate that vast extent of country by the sheer terror of his personality that the inhabitants were prostrate before him: not one of them dared lift hand against him. And yet he was able, at the same time, to inspire them all with so deep a desire to please him and win his favour that all they asked was to be guided by his judgment and his alone. Thus he knit to himself a complex of nationalities so vast that it would have taxed a man's endurance merely to traverse his empire in any one direction, east or west or south or north, from the palace which was its centre. For ourselves, considering his title to our admiration proved, we set ourselves to inquire what his parentage might have been and his natural parts, and how he was trained and brought up to attain so high a pitch of excellence in the government of men. And all we could learn from others about him or felt we might infer for ourselves we will here endeavour to set forth. (C.2) The father of Cyrus, so runs the story, was Cambyses, a king of the Persians, and one of the Perseidae, who look to Perseus as the founder of their race. His mother, it is agreed, was Mandane, the daughter of Astyages, king of the Medes. Of Cyrus himself, even now in the songs and stories of the East the record lives that nature made him most fair to look upon, and set in his heart the threefold love of man, of knowledge, and of honour. He would endure all labours, he would undergo all dangers, for the sake of glory.